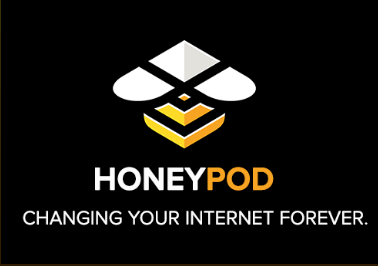 HONEYPOD, Changing your internet forever. Honeypod is a smart hardware unit that is the size of your palm of your hand. It connects directly to your internet router with intention of intercepting unwanted data, requests, and scripts from entering the internet connection of your device. By enabling a blocking system at the highest level page load speeds dramatically increase while at the same time detection of the hardware unit is impossible. Because Honeypod cannot detect it, cannot be stopped, blocked, or bypassed. The landscape of the internet as we know it today we built entirely around hidden services that have the intention of tracking and monitoring a person's every move, who they are, what they look at, and who they associate with without acknowledgement or consent. 75% of websites today have third-party or advertisement based tracking system installed purposefully to monitor user activity. Google and facebook, for example, build up detailed profiles on indivudials as they move around the web, assigning users unique identifiers so they can be recognized again over time regardless of where they are on the web similar to a fingerprint identity that is assigned to you. Not of only what search, see, read, and purchase, but also your location, times, dates, highly specific computer equipment information, and who your are associated with. CRYPTO EARNING Through the use of Honeypod, all users receive cryptocurrency tokens in a form similiar to mining based upon the amount of use of their Honeypod. Through promotional partners connected with Honeypod, users will also receive tokens. AD BLOCKING Unfortunately ads are becoming more and more forced upon the internet user to the point of becoming spam causing intensive bandwidth usage, long page load times, and dangerous malware attacking user devices. TRACKER BLOCKING Tracking services often piggyback off of legitimate services forcing the internet user to unknowingly divulge sensitive personal information that the internet user would not have otherwise freely provided. This personal information is then often sold to other services and companies. AUTHENTICATION Honeypod has the ability to be utilized as an authentication system to both receive tokens and purchase online services using cryptocurrency. There will no longer be a need to pull out your wallet every time you need to purchase a service, but rather Honeypod is your authenticator connected to your wallet or identity. FASTER INTERNET SPEEDS Tracking systems, advertisements, and unwanted 3rd-party services create internet lag, increase a website’s load times, and overall dramatically increase the amount of bandwidth required to use the internet. Honeypod removes these "road blocks" speeding up your internet service and saving you bandwidth by up to 40%. SIMPLE SETUP Honeypod is built to be a fully plug&play hardware system. Whether you are a novice or an expert in technology, Honeypod is intended to be simplistic giving you as much or as little configuration as you are comfortable with. Simple, easy, ready to use. VPN INTEGRATION For those that wish to have complete security and anonymity of their internet connection and data packets, Honeypod is fully integrated with OpenVPN and DNSCrypt through the Honeypod dashboard. FULL DATA MONITORING Complete monitoring access of all data requests and 3rd parties that attempt to access your device allowing you to have real-time insight into who is blocked, how many times they have tried to access you, and on which device. SECURITY THROUGH BLOCKCHAIN Utilizing a Byzantine consensus algorithm, your data and payment transactions are secure and confirmed preventing man-in-the-middle attacks, identity theft, credit card theft, and loss of private information. At the time of the public token sale, any eligible person may purchase HNY at the fixed price of %0.05 per HNY through wire transfer, ETH, BTC, or XLM.